Getting your kids to eat healthy foods can be a real pain. Sometimes they really don’t like the taste of certain foods, but other times, it’s actually just all in the mind. Over the years I’ve come across some hilarious yet brilliant tactics mom use to get their kids to eat healthier, and I must say, making fruit and vegetables look fun on a plate is one of the easiest ways to do so. A little bit of trickery, sure, but it’s for good reason. And if they’re exposed to these food in a fun way, they may come to realize that they aren’t actually all that bad. To spare you the daily fuss at the dinner table, try these easy healthy hacks to sneak veggies into your kids' food without all the drama. Take your children to your local supermarket and encourage them to pick out the weirdest vegetable they can find, to cook later with dinner. 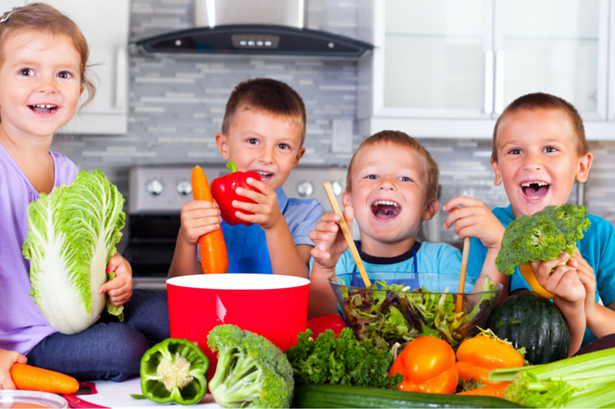 Spend some time in the kitchen, teaching your children about vegetables and their benefits. Put things into ‘kid terms’, aka broccoli will make you super strong like a superhero and carrots can help you see in the dark. They’ll soon be nibbling at their veg to test these theories. Kids love tucking into homemade cakes when they get home from school, so incorporating veg into the cake-mixing bowl is an easy way of getting them to eat more of the good stuff. Secret Sausages are an ingenious idea that not only provide you with one of your five a day, from just three sausages but also have 90% less fat and 50% fewer calories than the normal variety. Kids love omelettes and you can easily help them towards their five a day and up their vegetable intake by sneaking peppers, onions and tomatoes into their weekend breakfast treat. Throwing grated carrot into your next spaghetti bolognaise is also a super simple way of incorporating more veggies into your kids’ diet. They’ll never notice it once it’s mixed in with the sauce. Soup is an easy lunch option and kids won’t mind if the dish you’re serving them is simply a bowl of blended vegetables, if they also have a big chunk of bread to dunk in it. Your older kids might love that naughty Chinese takeaway every month but you can extend that treat even further with your very own stir fry creation that features plenty of delicious crunchy vegetables, coated in a yummy black bean sauce and complemented by noodles and your meat of choice. Ditch the jars of pasta sauce from the supermarket, filled with salt and sugar and other nasty ingredients, and make your own from scratch. Not only can you fill it with lots of vegetables that your kids won’t even realise they’re eating, but it will also develop your cooking skills as well. Herbs are vegetables too! Chives in potato salad, mixed herbs sprinkled generously onto a roast chicken and finely chopped mint thrown into a bowl of new potatoes will help your kids take that first step towards their five a day target. Sweet potato pizza bases are just as delicious and filling as the real deal, so try creating your very own with just 2-3 sweet potatoes and flour of your choice (almond flour is a great option because it has greater health benefits than regular flour). Use cookie cutters and cut vegetables into fun shapes that your kids will be more inclined to pick up and taste – peppers, cucumber and carrots work well. You could also make a funny face on a plate with raw carrots, celery and plum tomatoes or even spell out their name, distracting kids from what the food actually is will get them picking it up and trying it. Vegetable crisps are a great alternative to the usual fried potato kind and a great way of introducing children to healthy snacking. You can pick up sweet potato, beetroot, parsnip and carrot varieties that all use real vegetables and are cooked in a healthier way than traditional crisps. Swap out your traditional potatoes for the sweet kind. They aren’t really that different when it comes to calories or carb content but they do contain more fibre and Vitamin A and C, which will certainly benefit your kids. If your kids aren’t responding to any tactics you attempt when it comes to eating vegetables, it might be time to consider a little bribery. Maybe let them choose what to watch on TV for an hour that evening, let them have an extra half a scoop of ice cream for dessert or do a chore for them if they clear their plate of vegetables. The earlier your kids start tasting vegetables the more likely it is that they will continue to eat and even enjoy them. Wean your little ones onto solid food with mashed up carrot and sweet potatoes or treat them to a little bit of your morning smoothie, which should be packed with fruit and refreshing green spinach. Kids have a habit of refusing to even try things they ‘think’ they won’t like. You could enforce a rule whereby your child must try everything at least once, then if they really don’t like it they don’t have to eat it – and you can get sneaky in the kitchen. And look like you’re enjoying them! Positivity around vegetables will encourage your kids to be positive too. No matter what you’re serving up, frozen vegetables are quick and easy to cook and serve with any dish. Throw some into your macaroni and cheese, mix them into a stew or simply dish them up next to chicken nuggets and chips to encourage kids to eat them. ds to eat more veg and are great for stocking up on in warmer weather. Simply blitz together your favourite fruit smoothie mixes and then throw in handfuls of spinach or butternut squash to get your kids eating vegetables without even realising.